Compact rack and pinion design utilising the whole piston area to develop output torque. 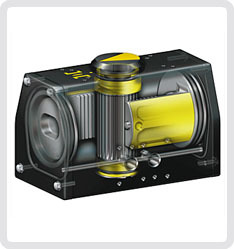 Pistons with integral rack drive reducing the number of dynamic seals, minimising air leakage. Double pistons nullify sideloads on the pinion shaft, minimising bearing wear. Hard anodised aluminium body, with external ESPC finish, protects against corrosive environments including saliferous atmospheres. Anti-friction piston pads ensuring no metal to metal contact, providing a smooth operation. Ideal for modulating or on/off control applications.